Welcome to the Holiday Inn Express Hotel & Suites Cape Girardeau. Conveniently located in Cape Girardeau Missouri at Interstate 55 and exit 96. 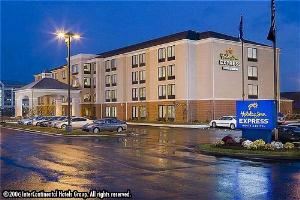 The Holiday Inn Express & Suites Cape Girardeau Hotel is midway between Memphis and St. Louis on I-55 within the West Park Hospitality Center Complex. Surrounded by a wide selection of eating establishments, this new-build hotel features 98 one room suites, a grand lobby area, free high speed internet service and two meeting rooms. Hotel amenities include an indoor pool, whirlpool, fitness room, game room and refrigerator & microwave in every room.We are proud to be a 100% smoke free facility.